Rain or shine…synthetic hair is the best way to ensure your hairstyle never frizzes or falls. There are many advantages to being able to put your style on in seconds. Synthetic wigs give you the freedom to have any style you want for a very affordable price and minimal effort. Weather proofing your look is simple with synthetic wigs. 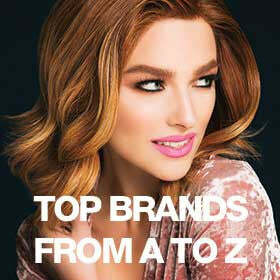 Easy, Easy, Easy - synthetic hair is so easy to take care of and have amazing style memory. This means the style or curl pattern is baked right in. You never have to restyle it - bonus! All you have to do is wash it and shake it out…viola! It returns to its original style. Versatility - as synthetic hair is much more easy to style and care for…you now have the flexibility to buy different styles and colors to try. Vibrant Hues - synthetic wigs have the most vibrant hues because the synthetic fiber holds color much more efficiently than human hair. It can take deeper and more striking colors easily. The best part...no fading! So go for that amazing red that will keep you at your hairdresser only every couple of weeks…now you can have that deep rich red from the salon look any time you would like! Cost Effective - the cost of synthetic is so much more affordable than human hair. You can get three or more great quality synthetic wigs for the price of one high-end human hair wig. 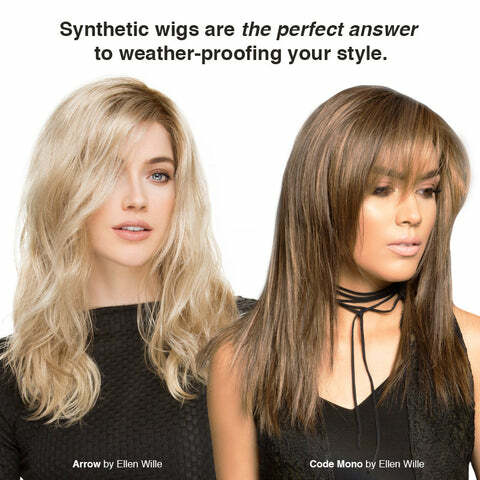 Of course, a wig lover always wants a good human hair wig at her fingertips…but for all weather hair and lots of options…nothing beats great synthetic wigs! Naturally Beautiful - with a good quality synthetic wig you get the look of human hair at a fraction of the cost. It is very hard to tell the difference between the human hair wig and a quality synthetic hair wig. This makes it such a wise and easy choice all the way around. Now there are also some challenges with synthetic wigs but if you keep a couple of things in mind…you will never go back, once you go synthetic! Shine - a drawback to some synthetic fiber (usually the lower quality synthetic) is that there may be an unnatural shine to the hair. This is easily remedied by washing the wig and once it is dry, you can spray on a hair powder or dry shampoo which leaves a light powder coating and will give a more natural look to the hair. Shorter life span - synthetic wigs live a shorter life than a high-end human hair wig. However, just because the life is shorter doesn’t mean it can't live a great life while it lasts! Synthetic makes life so much easier and the color doesn’t fade. Depending on the frequency of wear, your synthetic wig should last 3-6 months tops, but it's totally worth it! Style stays - synthetic wigs and toppers can’t be heat treated. The style you buy is the style you keep. Want a different style? Buy a different wig! However, there is heat friendly synthetic fiber that does allow you to change the style. Color stays - you can not re-color or change the color of synthetic wigs. However, this is not a bad thing. The color doesn’t fade either…this is a common problem with human hair. The upside is - sun will not fade it! Rain, snow, fog, or humidity... nothing messes up great hair day with synthetic wigs. Take advantage of the versatility and affordability you get wearing synthetic hair. Look like you spent hours on your hair...flawless with little effort! I just bought a synthetic wig for the first time. I am disappointed to read that they only last 3-6 months. I will be wearing mine only 3-4 hours a day maximum. Will it last longer than 3-6 months? Thank you. What are heat products? My synthetic wig mats in the back. Can I buy the product on wigs.com website? Please provide name of product. We recommend using a wide-toothed comb often, as well as heat product on the bottom of your wig to prevent matting. If you’d like to avoid carrying a comb, try a shorter style than you would typically wear. If the style doesn’t reach your shoulders, that means only minimal tangling! Please let us know if we can help you further – We’ll always be hair for you! Please let us know if you have any further questions! We’ll always be hair for you! What hair is being worn on the cover of this video? Dark hair, holding the red umbrella? I wear synthetics as my “hat hair” or give my hh hair a break days . I just switched from Jon Renau Angie to Gwyneth 6/33. The synthetic I’m asking about looks like it might be a good sister wig to Gwyneth. Thank you! What do you recommend for prevent the matting underneath on the back long part of the wig. My body runs warm and always clammy on the back of my neck and shoulders. Thanks. We do sell human hair, although this article is specifically about synthetic wigs. Thanks for your comment. Thanks for your advice! We love to receive suggestions from people who wear wigs everyday! Thanks again! I’ve always thought that synthetic wigs do fade over time. I have alopecia and wear a wig every day I tend to get a new one every 6 months. When you get a new wig the color is really rich. After about 3/4 months The color becomes paler. Hence I don’t go too light to start with. You asked a really great question! All synthetic is the same grade, however there are different qualities of synthetic fibers. Next, we have heat friendly synthetic, sometimes referred to as Heat Defiant, HD, or futura. This is pretty much a synthetic fiber that has went through a special process to be able to withstand heat up to a certain degree (usually 350 degrees Fahrenheit max). Be advised this fiber is more expensive than basic synthetic hair because you are paying for the process, however it doesn’t last as long a synthetic hair. This hair requires special care due to the process it had to go through in order to withstand heat. There is also an art to styling it. Heat Friendly Synthetic Fibers can last up to 3-6 months or more depending on how often you wear it and how well you care for it. We recommend the heat friendly synthetic fiber for primping or special occasions like the special events, date nights, holidays when cooking, etc. The more heat applied to this fiber the more wear and tear you put on the fiber, shortening the life span. We always recommend buying two of any item that you get in heat friendly synthetic fiber, one to wear straight and the other to wear curly/wavy and primp when needed. This way, you will get the most bang for your buck! In the paragraphs above, it mentions a lower grade synthetic which means there is a higher grade synthetic; how would I know the difference when I purchase a wig?